The Birthday Brights™ Bouquet is a true celebration of color and life to surprise and delight your special recipient on their big day! Hot pink gerbera daisies and orange roses take center stage surrounded by purple gilly flowers, yellow chrysanthemums, orange carnations, green button poms, bupleurum, and lush greens to create party perfect birthday display. Presented in a modern rectangular ceramic vase with colorful striping at the bottom, "Happy Birthday" lettering at the top, and a bright pink bow at the center, this unforgettable fresh flower arrangement is then accented with a striped happy birthday pick to create a fun and festive gift. BEST bouquet is approx. 17"H x 13"W.
The Birthday Brights™ Bouquet is a true celebration of color and life to surprise and delight your special recipient on their big day! Hot pink gerbera daisies and orange roses take center stage surrounded by purple gilly flowers, yellow chrysanthemums, orange carnations, green button poms, bupleurum, and lush greens to create party perfect birthday display. Presented in a modern rectangular ceramic vase with colorful striping at the bottom, "Happy Birthday" lettering at the top, and a bright pink bow at the center, this unforgettable fresh flower arrangement is then accented with a striped happy birthday pick to create a fun and festive gift. BETTER bouquet is approx.. 16"H x 12"W.
The Birthday Brights™ Bouquet is a true celebration of color and life to surprise and delight your special recipient on their big day! Hot pink gerbera daisies and orange roses take center stage surrounded by purple gilly flowers, yellow chrysanthemums, orange carnations, green button poms, bupleurum, and lush greens to create party perfect birthday display. Presented in a modern rectangular ceramic vase with colorful striping at the bottom, "Happy Birthday" lettering at the top, and a bright pink bow at the center, this unforgettable fresh flower arrangement is then accented with a striped happy birthday pick to create a fun and festive gift. EXQUISITE bouquet is approx. 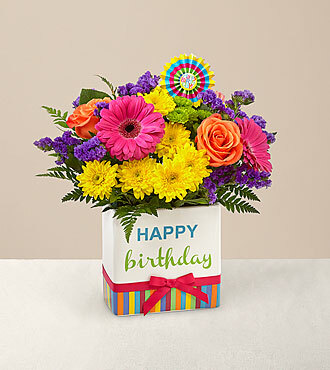 17"H x 14"W.
The Birthday Brights™ Bouquet is a true celebration of color and life to surprise and delight your special recipient on their big day! Hot pink gerbera daisies and orange roses take center stage surrounded by purple gilly flowers, yellow chrysanthemums, orange carnations, green button poms, bupleurum, and lush greens to create party perfect birthday display. Presented in a modern rectangular ceramic vase with colorful striping at the bottom, "Happy Birthday" lettering at the top, and a bright pink bow at the center, this unforgettable fresh flower arrangement is then accented with a striped happy birthday pick to create a fun and festive gift. GOOD bouquet is Approx. 14"H x 11"W.